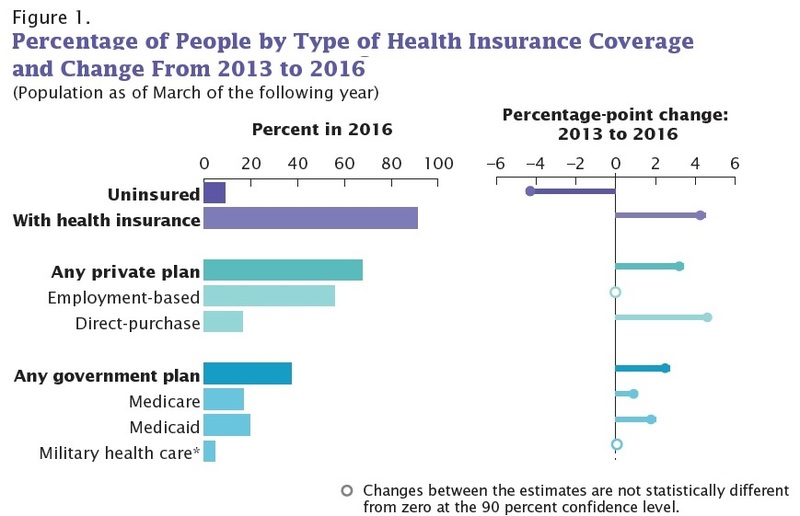 Since a number of major provisions of the Patient Protection and Affordable Care Act of 2010 took effect in January 2014, the share of Americans without health insurance has dropped substantially. But that success story remains incomplete, and the the progress that has been made has come at substantial financial cost. Jessica C. Barnett and Edward R. Berchick of the US Census Bureau have authored this year's version of the authoritative report: Health Insurance Coverage in the United States: 2016 (Current Population Reports, September 2017, P60-660). Here's the share of Americans without health insurance from 2008-2016. The big drop starting in 2014 is quickly apparent. What forms of health insurance expanded in a way that can help to explain this decline? In private plans, employer-based health insurance didn't budge, but direct-purchase plans expanded--surely due to the expansion that occurred through the subsidized state-based insurance exchanges. On the government side, both Medicare and Medicare have seen expansions, with the rise in Medicaid in particular being traceable to the 2010 Affordable Care Act. The report offers lots of detail about what groups are more or less likely to have health insurance. Many of the correlations are unsurprising. Those with less work experience in the previous year, or lower levels of education, are less likely to be covered by health insurance. Even with the existence of Medicaid and Medicare, those with lower incomes remain less likely to have health insurance (including both public and private health insurance). 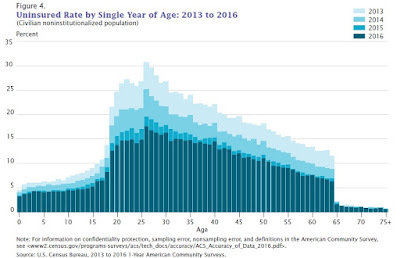 But I was intrigued by this figure showing the likelihood of not having health insurance by age. 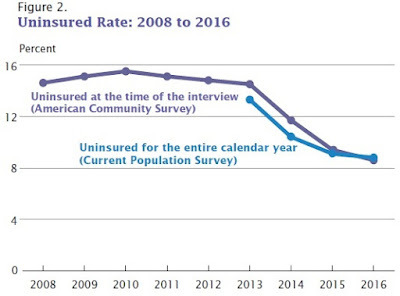 The different shading shows different years, and the drop in the rate of uninsured over time. The big drop-off around age 65 shows the effect of Medicare. The uninsurance rate for children is also relatively low, because low-income families with children are typically eligible for insurance through Medicaid and the Children's Health Insurance Program (CHIP). The age group least likely to have health insurance are in their 20s and 30s. This report from the Census Bureau is about documenting patterns, not drawing policy conclusions. But I'll add that the gains that have been made in expanding health insurance coverage are costing the US government about $110 billion per year, according to the Congressional Budget Office. As I've written in the past, I support expanded spending for this reason, given the very limited array of policy options actually available. But I do have a number of qualms. For example, a number of recipients of public health insurance or insurance subsidies might prefer a lower level of health insurance and more income in their pocket for other purposes--but that choice isn't available to them. Employer-provided health insurance in the United States is an untaxed fringe benefit that cost the US Treasury $266 billion in 2016, which encourages employers and employees to provide compensation in the form of health insurance and helps propel the ongoing rise in health care costs. Finally, the rate of uninsurance has fallen by less than one-half since the provisions of the Affordable Care Act went into effect. Thus, the problem that millions of Americans lack health insurance is far from resolved. 0 Komentar untuk "Health Insurance Coverage in the US"